The consensus attack cost is what it would cost to control 51% of the total hashing power of a cryptocurrency network, doing so would make it possible to 1) Prevent transactions from being confirmed, 2) Reverse recent transactions that have been sent, ‘double-spending’ your coins 3) Execute some sort of denial-of-service attacks against specific addresses like exchanges, or other miners or pools. Any of this would collectively erode confidence in network, and, with a very high probability, cause a significant price decline. Well if you have all that hashing power you’re better off mining coins than attacking the network! Ethereum Classic uses ETHASH (the same algorithm as Ethereum’s) I mean you don’t need to setup or buy anything at all, If you’re already mining Ethereum, and your pool contributes with small percentage of only 2.5% of Ethereum Nethash, Switch to mine Ethereum Classic and you’re now +51% of hashing power of Ethereum Classic network. First, there is no barrier of entry for you, and second, your cost of 51% attack on ETC is your ETH mining profit per day, for a miner mining 2.5% of ETH Nethash the gain is about 525 ETH per day which is ~$380k USD, which is pretty much the cost of 51% on ETC per day, and please let’s not forget that the Ethereum Classic network has a ~2 billion market-cap. The ‘Better off mining coins than attacking’: No you’re not, with that 7000 GH/s mining power you have which is about 2.5% of ETH Nethash you’re making currently 525 ETH or ~380k USD per day. However, by attacking ETC, while short-selling ETC with n margin on the open market would make you 3x to 100x that profit from the ETC price decline — We will discuss this in details in a bit..
A Byzantine miner with +7.0 TH/s hashrate of the list below is able to perform a consensus attack on ETC today in an hour. and a miner, like Ethermine pool, can do that by allocating only 10% of their hashing power. As we found out, the traditional methodology of calculating the cost of a 51% attack -from the cost of mining equipment acquisition- might be completely-off for networks with a total hashrate significantly smaller than others that use the same hashing algorithm, and you can perform that attack at a fraction of the cost. Now it’s true that you as Byzantine miner (w/ +51% of network hashrate) can benefit with ‘double-spending’, by sending $10mm of ETC to one exchange then re-minting the blocks and sending it again to another one. However, the compelling true financial benefit you might be pursuing is through preventing transactions from being confirmed on the network + executing DoS on exchanges and other pool addresses, this makes it clear that the network is under 51% attack and erodes confidence in this cryptocurrency which would eventually cause a significant price decline. Nakamoto-consensus was designed with the assumption that rational miners working in their best financial interest, wouldn’t perform such attack as they can’t benefit from price decline. Today 9 years later clearly these assumptions are very outdated, We do have major exchanges with a lot of liquidity which allow you to short-sell with a trading margin from 2.2x to up to 100x (to benefit from price declines significantly) like Poloniex, BitFinex, Kraken and GDAX — Futures market like CME and Exante(and many others lining up) we have derivatives markets like, BitMex, WhaleClub and CFDs like AVAtrade, and Plus500, Options like LedgerX and the decentralized prediction markets like Augur, and Gnosis — which have been becoming popular. You see where I’m going with this.. it’s just becoming easier everyday and the market is more liquid for opportunities where you can benefit from price decline. I’ve promised you a realistic lucrative scenario, let’s get to that.. so what is realistically the amount a malicious attacker a Byzantine miner could spare for this venture attacking our example here Ethereum Classic a $2 Billions market-cap? 1 billion? 500 or 100 millions? it becomes interesting as hell if you can do it with like 10 million or even only 1 million! We take this one step further by putting some serious investment on this venture, to do so, we need to know how is the liquidity and how much the market can afford to pay us. The average trading volume of Ethereum classic is currently in the range of $150 million per day (with a history of up to 1.4B /day last year) we can take this as a reference for liquidity, and make a simulation for investment with a bigger stake. As you can see in our simulation here, $50mm investment to short-sell ETC with 35x margin, a decline of 50% will net ~$ 1B and if the price continues to decline we would break the bank with a +90% price decline, which would net you $1.8B profit (currently that is the market-cap of ETC). 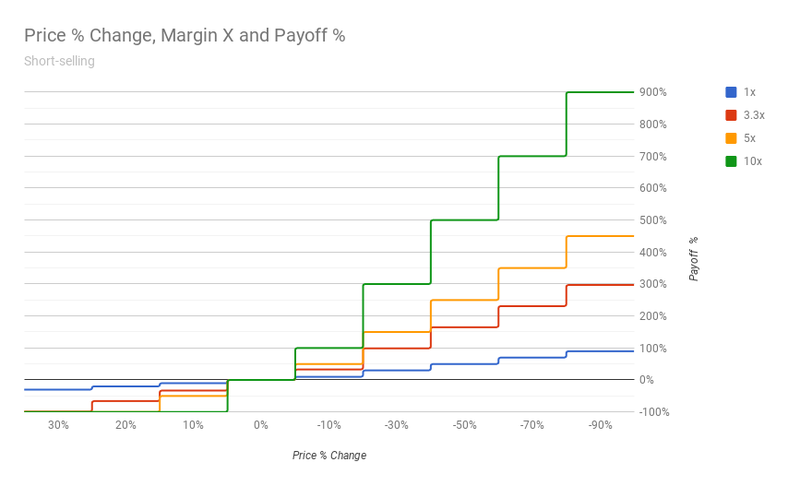 And if 35x margin was a stretch for you to secure, then just increase the investment from $50mm to $200mm instead and with 10x margin you will get pretty much the same results — $ payoff. Vlad Zamfir in Simple model of an internal PoW attacker introduced a sound assumption that honest miners working in their best financial interest would switch to mine on a different network when you add hashpower to current networks. 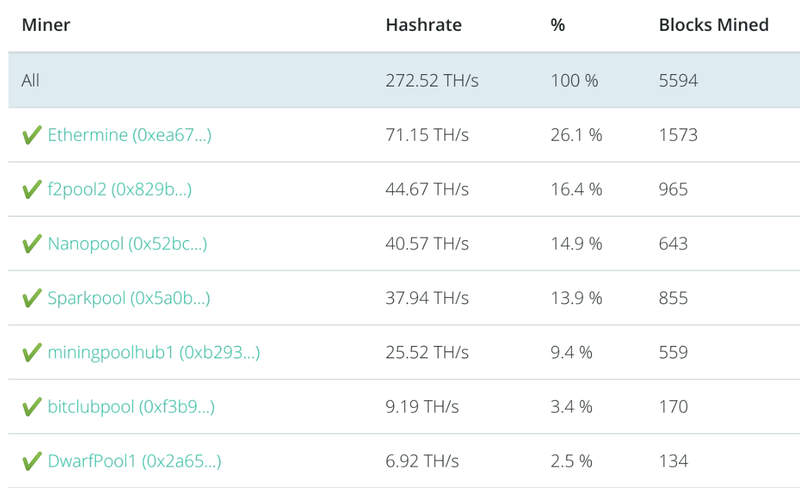 That when you add a smaller % like 3.5 TH/s to ETC of 7TH/s, the total nethash truly becomes 10.5 TH/s and you’re controlling only 33%, but as as difficulty adjustments make it no more profitable for honest miners to continue mining ETC, they would switch to mine on different networks and you end up with +51% . 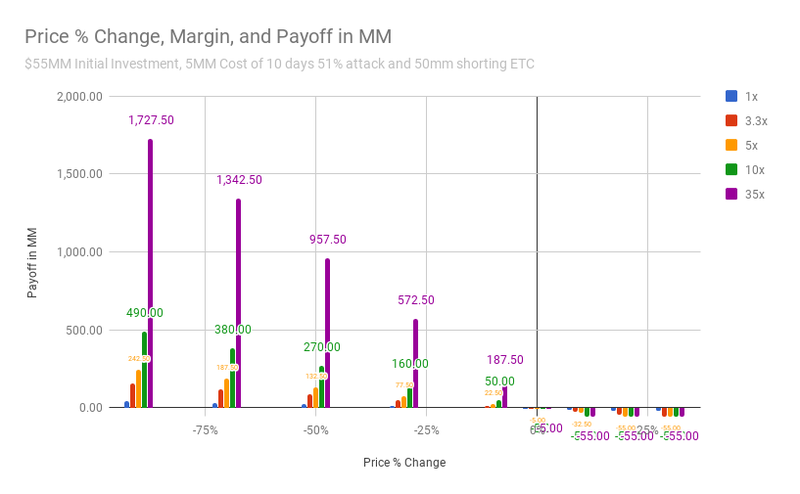 I’m keen to believe a mixture of #2 and #3 is the more likely scenario, which would put the cost of Ethereum classic attack in our example here to less than $200k per day. What about the cost of attacking other coins? Bitcoin Cash: Following the same logic you can observe that the cost of 51% on Bitcoin Cash Network is not the $300 million (which is what would cost you to to acquire miners with enough hashing power to be 51%) but only 250 BTC or $2 million, by switching from mining BTC to BCH. Bitcoin Gold: Bitcoin Gold, a much smaller network(1/20 the size of Bitcoin Cash network), since the fork, has switched to become ASIC resistant hashing with Equihash algorithm, — same as zCash — It is currently more secure against 51% attack from Bitcoin miners, but vulnerable to attacks from Zcash and other Equihash miners. We demonstrated how you can profitably attack a $2 billions cryptocurrency network like Ethereum Classic, with as little as $1.5 million, and how you can ‘bankrupt it’ with $55 million netting +$1B in profit. Now, a growing number of institutional investors are watching crypto-currencies, ruthless intimidating wizards and trolls, standing on the tips of their toes aiming to exploit opportunities for quick and big profits, they aren’t the type of ‘dudes’ you’re used to, the ones that care about the community, the ecosystem and the future of decentralization. How can we fix and increase the robustness of networks? Upgrade to PoS, check out Casper FFG, PoS in general is much safer and 51% practically infeasible, but by just adding Finality the Capser FFG style you will significantly increase robustness. Increase required confirmation (A LOT More) a byzantine miner can send an ETC equivalent of $100mm swap it for BTC, while mining his own in-shadow chain disconnected from ETC, and when he liquidates his $100mm he propagates his in-shadow blocks. As it has more hashing power behind it, and because it is the longer chain, it would replace the current one and the miner would now be ‘double spending’. What do you think? What can we do to improve the robustness, security, and minimize the effect of a 51% attack particularly on these networks that use same hashing algorithm like bigger ones, with smaller nethash?